The Boston Globe published a compelling story last weekend, revealing that the Museum of Fine Arts in that city has agreed to return to Turkey its half of a 1,800-year-old statue known as ‘Weary Herakles’. 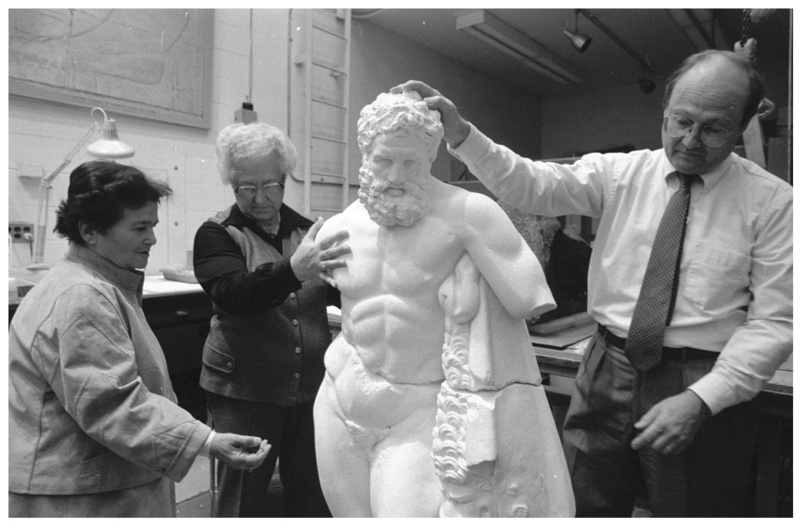 The lower half of the statue was discovered in 1980 at Perge, near Antalya, and now stands in the city’s museum. The top half mysteriously surfaced a year later in America, where a German dealer claimed it had been in his mother’s collection since 1950. To Turkish archaeologists, who have long argued that the top half was illegally smuggled out the country around the same time that the lower half was discovered, the case epitomised the stubbornness of foreign museums in clinging on to acquisitions with even the most dubious provenance. For the full story, read the excellent Boston Globe piece here. I wrote a piece for the Times about the return of the statue looking at it more in the context of Turkey’s wider campaign for the restitution of stolen artefacts. The Turkish government has started taking the issue far more seriously, and recently twisted the arm of the Pergamon Museum in Berlin to secure the return of a 3,500 year old sphinx. You can read my Times story here. Flush with economic success and growing diplomatic clout, Turkey is showing its newfound confidence in its battle for the return of stolen artefacts. Its tactic of threatening European archaeological teams demonstrates that it no longer needs foreign expertise to explore and catalogue its historical riches. Over the past two decades, Turkey has undergone extraordinary economic growth, which has led to the opening of a host of new universities and more research funding. For outside teams, the annual renewal of digging permits is no longer a certainty. Turkey’s reinvigorated interest in its ancient antiquities stems from a change in national outlook. When Mustafa Kemal Atatürk founded the modern Turkish Republic in 1923, its identity rested on the rejection of its Islamic past and the claims of any other nations to the land of Anatolia. For decades, Turkey’s leaders were indifferent to their own Ottoman heritage, let alone to the wealth of archaeological artefacts left behind by many pre-Turkish civilisations. When the Islam-inspired Justice and Development Party came to power in 2002, they brought with them a love affair for all things Ottoman that has helped to reawaken the country to its past. Turkey no longer views the presence of Byzantine, Greek, and Roman ruins as an implicit challenge to its sovereignty. The irony is that this new interest comes at a time when a host of massive infrastructure projects, particularly dams, are threatening to destroy much of the heritage. At the risk of shooting down my own analysis, I think it’s difficult to ascribe changes in Turkish society directly to the Justice and Development Party with any degree of certainty, as people habitually try to do. At present, Turkey is experiencing rapid, economically-driven social and demographic change, and it is hard to draw any certain line between cause and effect. In my opinion, if Turks are indeed more interested in Anatolia’s Ottoman, and pre-Ottoman history, as several archaeologists suggested to me, it also has something to do with the country’s general prosperity. Now that Turkey is a confident, relatively prosperous and successful nation, it can look its Roman, Greek, and Byzantine history in the eye without feeling threatened. Have been off on holiday for a week and just got back. Having slipped very happily into the calm, blue waters of Turkey’s Lycian coast, I’m now returning rather more reluctantly to the murky turbulent waters of its political scene. The documentary I made on my trip to the Syrian border for VBS (an online video news/entertainment channel run by the youth magazine Vice) is out today. You can see it here.